WASHINGTON (AP) — If a woman can be president, can a woman also tell a dirty joke? Amy Klobuchar thinks so. The U.S. senator from Minnesota and famously snow-swept presidential candidate was the Democratic speaker for the 134th annual Gridiron Club and Foundation dinner. The event calls for good-natured roasting through songs, skits and speeches as a break from the daily battles between journalists and government officials. Klobuchar promised the audience at the Renaissance Washington Hotel that her remarks would be “shorter than a Robert Kraft visit to the Orchids day spa.” Kraft, the owner of the New England Patriots and a friend of President Donald Trump, has been charged in Florida with two counts of soliciting prostitution. 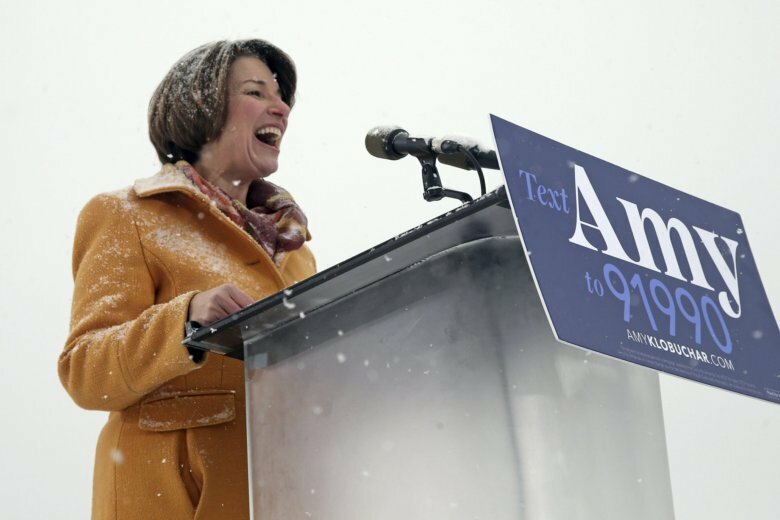 Recounting her campaign kickoff speech amid a snowstorm in Minneapolis — Trump called her “Snowman(woman)” — Klobuchar wondered aloud how Trump’s hair would fare in a blizzard. Not that Kennedy enjoyed the low-scoring Super Bowl between the Patriots and the Los Angeles Rams. “If I had wanted to watch guys failing to score for four hours,” he would have taken fellow senators Ted Cruz and Bernie Sanders to a singles bar. Trump skipped the dinner his first year in office but attended last year, giving a half-hour speech with plenty of one-liners. His daughter and senior adviser, Ivanka Trump, told the audience that he asked her to step in for him. Other administration officials attending the dinner included Ivanka Trump’s husband, senior adviser Jared Kushner; presidential press secretary Sarah Sanders; Trump senior adviser Kellyanne Conway; acting White House chief of staff Mick Mulvaney; Treasury Secretary Steven Mnuchin; Housing and Urban Development Secretary Ben Carson; and Homeland Security Secretary Kirstjen Nielsen. Also on hand were Deputy Attorney General Rod Rosenstein, Sen. Cruz of Texas and Sens. Jerry Moran and Pat Roberts of Kansas. The annual dinner traces its history to 1885. President Grover Cleveland refused to attend, but every president since has come to at least one Gridiron. The organization counts many of Washington’s more prominent journalists in its membership. The dinner traditionally attracts journalists, media executives, lawmakers, government officials and military officers. A charitable organization, the Gridiron Club and Foundation contributes to college scholarships and journalistic organizations.